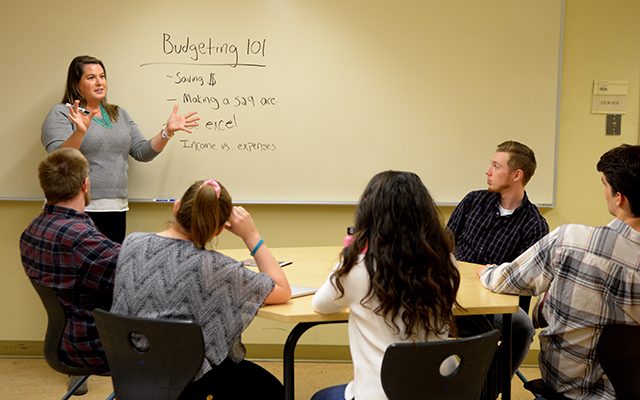 Sarah Hinman, UMF coordinator of the Financial Literacy Peer Education Program, prepares the program’s peer educators for outreach to students. FARMINGTON - How can tacos help students at the University of Maine at Farmington become more financially literate about taxes, debt management and personal finance? The UMF Financial Literacy Peer Education Program is hosting a “Taxes and Tacos” event for students, 9 a.m.–6:30 p.m., Monday, Feb. 11, in the Kalikow Education Center lobby, to help any students with their state and federal tax filing. Students are invited to stop by with their financial paperwork, have a “walking taco” and meet with a UMF Peer Educator who has been certified by the Internal Revenue Service as a volunteer tax preparer. In addition to helping students file their taxes, the program’s goal is to increase student financial literacy by raising awareness about the importance of personal money management, student loan borrowing, FAFSA filing, default prevention and financial aid. Peer Educators are available on campus throughout the academic year to meet one-on-one with students to help them navigate their individual financial picture. Information is also presented in the form of skits, workshops, presentations and visual media. A financial literacy blog on ways to save money, what not to do with subsidized loans, career tips and other important topics can be found at http://www2.umf.maine.edu/financialliteracy/posts/. Funded by a grant from the Maine Attorney General’s office, the Financial Literacy Peer Education Program’s mission is to implement the program at all seven University of Maine schools over the next three years. The University of Maine at Farmington will be the home base for the program and will host a yearly peer educator training camp. By the end of the grant’s five year life span the system-wide program will also be involved with outreach to local high schools, middle schools and community colleges.